Pirkus, Inc. has just released a very funky looking robot, the Chobi Pirkus R Type-02. 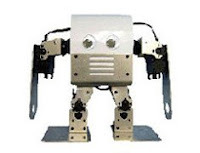 The Type-02 is a small 8-DOF 17cm tall biped robot. It also has a slightly simpler little brother, the Type II-02. The size of the chassis, if it is as large as it looks, would almost make it a candidate for a PC/104 system strapped to the back. With those eyes though, it looks like you'd have to buy two - one for your girlfriend!